It’s been over 100 days since Hurricane Irma struck Puerto Rico in September, followed by Hurricane Maria less than two weeks later. 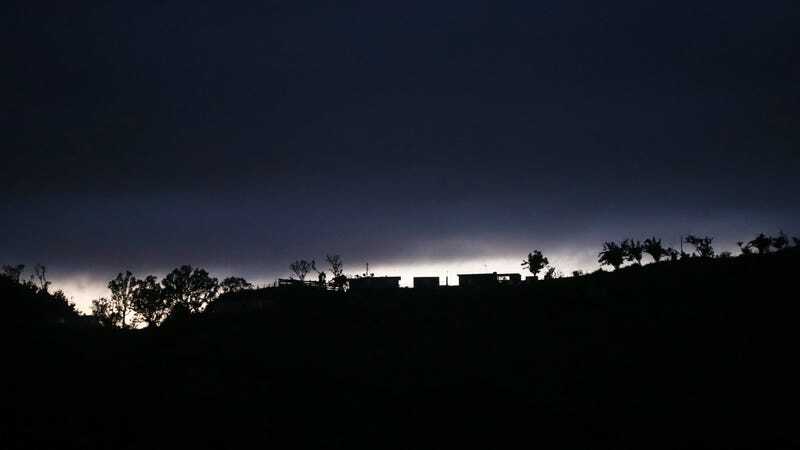 Puerto Rican Governor Ricardo Rosselló initially said the island would have almost all its power restored by now, but that date is looking more like next May—just in time for the 2018 hurricane season. While the island remains in the dark, so does its ongoing humanitarian crisis. A group of lawyers and advocates, however, are trying to change that. In fact, they have been for the last three years—because though Hurricanes Irma and Maria pushed the island to the edge, these natural disasters certainly didn’t start this mess. “[This crisis is] not the direct result of the hurricanes more than it is the result of a really bad public policy that has made our population more vulnerable,” Annette Martinez, director of the Caribbean Institute for Human Rights, told Earther. Martinez has been coordinating the recent effort to highlight human rights violations on the island, working with more than 30 community groups. These violations include environmental hazards that are threatening human health and a lack of access to basic services like clean water and education. In the past, Martinez has looked at how the island’s austerity measures and public debt were injuring human rights. Martinez and her team lay out these human rights violations in a final 400-page report they’ll be submitting to the Inter-American Commission on Human Rights in a few days. They sat before the commission earlier this month, dictating some of what this report will include, but The New Republic made a 15-page chapter of that report public. This single chapter gives readers a taste of just how high the stakes are for the U.S. citizens who call Puerto Rico home. For one, the lack of electricity means people are relying on generators (well, those who can afford it). The report notes 100,000 generators are being used across the island. Some of the island’s wealthier residents can throw down funds for the diesel needed to power these bad boys, but those with a more-modest income rely on the generators for specific uses, like powering air conditioners at night in order to get a decent sleep. The thing is, as this chapter makes clear, these generators also emit dangerous diesel fumes full of particulate matter that potentially pose public health risks—like cancer. Until power is returned, entire communities are breathing these fumes. According to the report, authorities have failed to check in on a five-story coal ash pile in the Salinas-Guayama region in the Southeast. Coal ash is full of heavy metals and toxins that can pose developmental and health risks if ingested through water. The Puerto Rican government left this garbage uncovered during the disaster, and community members are sure the toxins have entered the ground and likely found its way into waterways. The question is: Is it in their drinking water, too? Part of what this report asks is to get boots on the ground to analyze where the coal ash has traveled and how it’s impacting people’s health. At this point, people like Santiago don’t care who comes down; it can be the Puerto Rican government or the Inter-American Commission. What matters is that someone takes a look. This team is now wrapping up the final report to formally submit to the Inter-American Commission and make available to the public. During their hearing with the commission, Commission President Margarette May Macaulay made a formal request to the United States to have the commission conduct an on-site visit as early as January. Since the crisis, the federal government has approved about $5 billion to help the island post-disaster. But the island needs $94 billion to rebuild. The House’s $81 billion disaster package also does nothing to save the U.S. territory’s (as well as the U.S. Virgin Islands’) Medicaid programs. Critics argue the government can be doing more. Martinez has other plans until then: She and those involved in the report will hold discussions and meetings throughout the island to better document the human rights violations. They want to identify specific cases to bring before the commission and build a legal claim. That’s right: They’re willing to head to the courts, too, if things don’t get better quick. “This is just the beginning in terms of our work,” Martinez said. Getting before the commission was a step in the right direction, especially Macaulay’s formal request during the hearing—a move that Martinez said rarely happens during these hearings. Still, this means that this holiday season, the island won’t be full of its usual lights, laughs, and liveliness that accompany the new year, as The New Republic noted. The island will, instead, be dark and full of nostalgic U.S. citizens mulling over what the holidays should have been—especially in regions like the Southeast whose views include smokestacks and pollution. So this holiday season, she’s skipping the presents. Instead, she’ll be helping her community find light amid the darkness.